Thermostat Model ITD was designed specifically for monitoring temperature of liquids and for over temperature protection of oil transformers. This thermostat has a brass body machined from solid drawn rod. 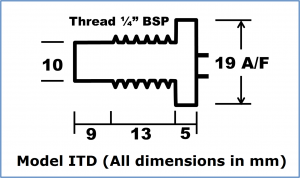 It has a 1/4″ BSP Hex nut threading for screwing into any location, like hydraulic lines, tanks, pipe lines, radiators, engines, oil filled transformers, oil baths etc. 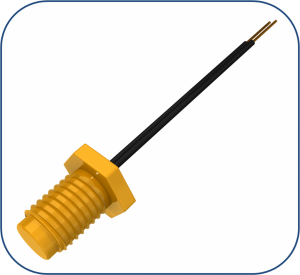 This thermostat is also available with a threaded extension at the lead end for conduit connection. All the internal components and spot welded and the contacts are made of solid silver. This provide the thermostat with a long life. The body of the thermostat is double sealed and it is not affected by varnish, dust, fumes, gases, etc. The lead wires are teflon insulated and can with stand high temperature. This thermal overload protector is available with Normally Open (N.O.) or Normally Closed (N.C.) contacts. The normal snap action disc thermostats have delayed restart and the trip temperature drifts downwards after using it for a few months. Our thermostats is based on the over center mechanism which operates a snap action bimetal and beryllium copper switching blade. This results in stable trip temperature even after continuous usage, quick restart and quick make and break switching. Switching Action SPST Normally Closed (N.C.) contacts which open with a snap action at preset temperature. Also available Normally Open (N.O.) contacts which close with a snap action at preset temperature. Restart Mode Automatic restart upon cooling.